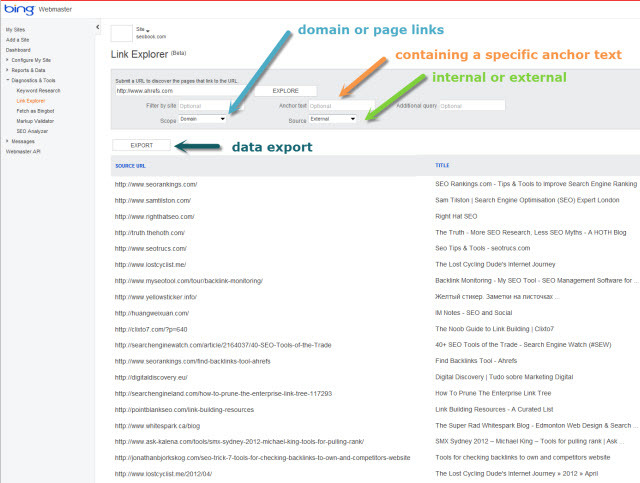 Bing refreshed their webmaster tools offering & now allows you to look up link data for 3rd party sites. We recently interviewed Bing's Duane Forrester about the new SEO tools & their product roadmap. Here is a screenshot of their new link explorer, but I highly recommend setting up an account and checking it out firsthand. For a long time Yahoo! provided great link data, but most other search engines were more reserved with sharing link data for competing sites. What were some of the driving forces behind Bing opening up on this front? Bing values the power of strong partnerships as one way to spur innovation and deliver compelling experiences for our users. For any partnership to be effective, remaining as transparent as possible is critical, including those we forge with agency and publisher partners. Sharing link information was something very clearly asked for by tool users, so after doing the internal work to see if we could provide the information, it was an easy decision to build this tool when the answer came back positive. You wanted it, we had it and could share it. Done. As a search engine your web index is much much larger than most SEO tools. On Twitter Rand mentioned that the index size of Bing's new Link Explorer was fairly comparable to Open Site Explorer. Is the link data offered in the tool a select slice of the index? Were you trying to highlight the highest quality link sources for each site? We see the entire index, or at least "can" see the entire index and link ecosystem. We’re limited to the actual number we can show at any given time, however. Currently it appears as though the tool lists link source URLs & page titles. Will the tool also add anchor text listings at some point? There are filters for "anchor text" and "additional query." What are the differences between these filters? Anchor Text is pretty clear to most SEOs. "Additional Query" allows you to look for, as an example, a page with "N" text appearing on it. So text not just as "anchor text", but simply appearing on the page. Currently if I search for "car" I believe it will match pages that have something like "carson" on it. In the future will there be a way to search for an exact word without extra characters? I’m going to split this answer. Users can enable “Strict” filtering to only see “cars” data by selecting the “Strict” box. To your point, however, this is what some of our tools are Beta. We will continually refine them as time goes on, adding features folks find useful. Will you guys also offer TLD-based filters at some point? First time anyone's mentioned it, so I’ll add this to our list for consideration. A few years ago my wife was at a PPC seminar where a Bing representative stated that the keyword search data provided in the tools matched your internal data. Is this still the case? Bing Advertising is completely separate from Webmaster Tools. I’m not sure if that rep was meaning data within the adCenter tools matches data or what. Bing WMT does import CPC data to showcase alongside keywords which sent traffic to your site. That data matches as we pull direct from adCenter. The data we show through our tools comes direct from Bing Search, so that’s a match if this is what you’re referring to. Bing's Webmaster tools offers an API with keyword research & link data. Bing's Ad Intelligence is easily one of my 3 favorite SEO tools. Will Bing eventually offer a similar SEO-oriented plugin for Excel? No plans on the roadmap for an Excel plugin. At SMX Derrick Connell suggested that there was a relevancy perception gap perhaps due to branding. What are some of the features people should try or things they should search for that really highlight where Bing is much stronger than competing services? Without doubt people should be logging in and using the Facebook integration when searching. This feature is tremendously helpful when you’re researching something, for example, as you can reach out directly to friends for input during your research process. While searching, keep your eyes open for the caret that indicates there is more data about a specific result. Hovering over that activates the “snapshot” showing the richer experience we have for that result. Businesses need to make sure they focus on social and managing it properly. It’s not going away and those who lag will find themselves facing stiff, new competition from those getting social right. Businesses also need to get moving adopting rich snippets on their sites. This data helps us provide the deeper experiences the new consumer interface is capable of in some cases. You have wrote a couple books & done a significant amount of offline marketing. One big trend that has been highlighted for years and years is everything moving online, but as search advances do you see offline marketing as becoming an important point of differentiation for many online plays? In a way yes. In fact, with the simplification of SEO via tools like our own and many others, more and more businesses can get things done to a level on their own. SEO will eventually become a common marketing tactic, and when that hits, we’re right back to a more traditional view of marketing: where all tactics are brought to bear to sell a product or service. Think of this…email marketing is still one of the single best converting forms of marketing in existence. Yet so many businesses focus on SEO (drive new traffic!) instead of email (work with current, proven shoppers!). In fact, neither alone is the "best" strategy for most online businesses. It’s a blend of everything. Social happens either with you or without you. You can influence it, and by participating, the signals the engines see change. We can see those changes and it helps us understand if a searcher might or might not have a good experience with you. That can influence (when combined with a ton of other factors, obviously) how we rank you. Everything is connected today. Complex? Sure, but back in the day marketers faced similar complexity with their own programs. Just a new "complex" for us today. More in the mix to manage. What is the best part about being an SEO who also works for a search engine? On Wednesday, June 6th at 10AM PST, I was part of the team that brought a new level of tools forward, resetting expectations around what Webmaster Tools should deliver to users. Easily one of the proudest moments of my life was that release. 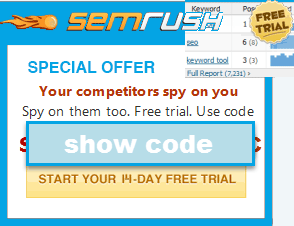 While I’m an SEO and I work for the engine, the PM and Lead Engineer on the WMT product are also SEOs. ;) To say Bing is investing in building the partnership with SEOs is no mere boast. Great tools like this happen because the people building them live the life of the user. What is the hardest part about being an SEO who also works for a search engine? Still so few people around me that speak this language. The main difficulty is in trying to understand the sheer scope of search. Because everything you thought you knew as an SEO take son an entirely different dimension when you’re inside the engine. Imagine taking every SEO conversation and viewing it through a prism. So many more things to consider. And, finally, nothing against Matt here, but why are dogs so much better than cats? 5 – when was the last time your cat fetched anything for you? 7 – guard cat? Hardly… you’d be better off with peacocks in the yard. Duane also did a video review of their new tools on SEOmoz, which highlights how they show rank & traffic data on a per keyword & per page basis. To learn more about Bing, subscribe to their search blog & their webmaster central blog. Duane also shares SEO information on Twitter @DuaneForrester & via his personal blog.